This Product Is Non-Returnable! Signing Naturally Units 7-12 is a continuation of Units 1-6 in the Signing Naturally series. Units 7-12 picks up where its predecessor left off and further enhances your classroom instruction. Utilizing the same functional, skill building, and comprehension approaches found in Units 1-6, key dialogues, narratives, and vocabulary lead to student excellence. Units 7-12 integrates culture and language learning, with culture lessons in every unit to expand students' understanding of our world. Signing Naturally Units 1-6 (sold separately), and now Units 7-12 complete the full 12 units that replace the original Level 1 materials! 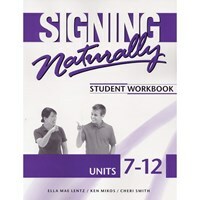 Come and see why Signing Naturally Units 7-12 is the perfect companion to your ASL classroom. This curriculum will ensure your students use their ASL skills BEYOND the classroom!